More and more people are looking to spend as much time outdoors as they can with family and friends. With family outing being held outdoors and tailgate season is fast approaching with college and the NFL getting ready to get underway, people will be looking for a new instant canopy. 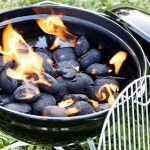 These are perfect for tailgating as they provide plenty protection from the sun and other elements. The instant canopy is an extremely versatile piece of outdoor equipment that can be used in a number of different outdoor settings including camping, the beach, and tailgating. These instant shelters come in a number of different configurations that make them each unique in the way that they are used. There some that would make the best canopy for camping, while others would be best suited for the beach. 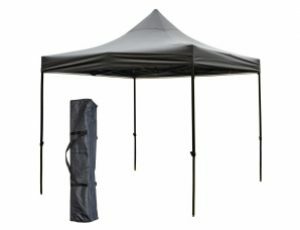 After doing plenty of online research for this article where we looked for the best instant canopy and we were able to put together a list of the top products and included reviews for each of the Top 10. Coleman is one of the leading makers of outdoor shelters like instant canopies and camping tents. Their instant canopies are made from only highest quality materials and design that makes them one of the best in the industry. This 13′ x 13′ canopy can be fully assembled in just a few minutes and is capable of standing up to moderate wind (when using the included guidelines and nylon stakes) and provides plenty of shade against the direct sunlight. The Coleman Instant Canopy is a high quality shelter that features a one-piece folding frame with four telescoping legs that allows it to be fully set up in as little as 3 minutes. The canopy is made from an exclusive heavy duty Polyguard 2X™ fabric that we handle many years of usage. The four poles feature a solid platform for stability and tie downs with anchors. The cover features built in eaves for extra coverage (169 sq ft) and an extra high center height of 9’7″. This Coleman Instant Canopy is perfect for a number of different outdoor uses and the simple setup will ensure that you will still have plenty of time to enjoy your tailgating for the big game or keep out the sun or rain for the family picnic at the local park. The Core 10′ x 10″ Instant Shelter is a heavy duty and best pop up canopy that can bes used for mutlipurposes. The unique construction is designed to help you be able to set it up completely in just a couple minutes. The shelter when fully assembled provides 100 sq ft of room and helps to keep the hot sun and rain at bay. The whole canopy folds back down and fits neatly back into the carry bag with zipper closure and wheels that make it easy to transport it. The instant shelter from CORE features a foldable one-piece all steel frame with a slide lock design that means you can easily have it fully set up in just a couple minutes. The canopy is made from a heavy duty 150D polyester fabric that will help keep out the rain and the sun. The built in tie downs and stakes will help keep it in place even with a moderate amount of wind. The 10’x10′ size means that it can easily fit a 6′ folding table and chairs completely under the cover. It has a high center point to provide extra clearance inside the so that people are able to stand up inside. This CORE Instant Shelter assembles very quickly and can be used for a number of different purposes like tailgating, camping, backyard get together. The Quick Canopy from Lightspeed Outdoors is a very versatile sunshade that can be easily carried to the beach, the park, any campsite and even the backyard. The unique design makes it simple for a single person the pitch it in just a couple minutes. It is made from only the highest quality materials and workmanship. The exclusive dome shape and solid back wall and hoof help to provide an awesome amount shade and comfort wherever you want it. The quick setup system features a bottom pull release hub with an umbrella style setup system. The lightweight flexible poles are pre-attached to make the set up quicker. The guidelines are attached to the outside and it comes with six sturdy nylon stakes to help keep it in place. The shelter is covered by a polyester fabric with a waterproof coating and the floor is also made from a polyester material. The solid back wall helps to keep the wind out and the 7.5′ x 7.5′ floor and 5′ high center gives you enough room to fit up to four chairs. The Lightspeed Outdoors Quick Canopy is the perfect portable shelter that can be used for a number of different purposes. 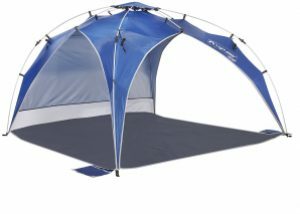 It is ultra lightweight and is super easy to set up anywhere you are needing a shelter. The Coleman brand is one of the most widely recognizable names in the outdoor equipment industry. They specialize in making shelters like tents and canopies. The Instant Canopy with LED Lighting is one of their newest models they sell. It features a spacious 100 sq ft of shade underneath an extremely sturdy portable structure. It can set up in a matter of minutes just about anywhere you need it to be. Using the included guidelines and nylon stakes you be sure that it won’t go anywhere during a moderate rain of wind. All steel, the one-piece foldable frame is ultra lightweight, yet when fully erected it is capable of withstanding a decent amount of wind and rain. 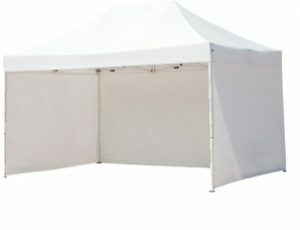 The canopy is made from high strength polyester fabric with a unique coating the help to prevent damage from the sun’s harmful UV-rays and prevents rain from penetrating it as well. The unique quick setup frame creates an amazing 9.5′ center height. The ceiling of the canopy features an exclusive four LED lighting system that can be adjusted to four different positions depending on lighting needs. The Instant Canopy with LED Lighting is the perfect model for those times you are planning an evening get together or for an event that is designed to occur at night. The bright LED lights can be adjusted depending on your needs. 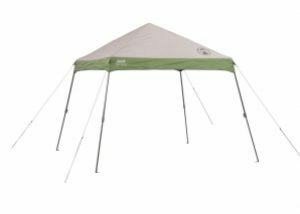 The Expedition EX64 Instant Canopy is made from all lightweight and sturdy materials. It is designed to be pitched in about a minute and features slanted poles provides an amazing 100 sq ft of shaded area. It is designed especially to be erected on any type of surface thanks to the nylon feet at the bottom of each leg. The built in tie downs help to keep the canopy in place in case of heavy wind and rain. This large instant canopy features a quick setup folding frame mechanism made from all steel material and coated with an ultra durable powder coating. The canopy is made from a heavy duty durable 150D polyester material with an Aluminex™ coating that provides UV and rain protection. The poles are configured in a slanted design and feature mar resistant nylon feet that prevent damage to a deck or patio. It does also come with built in tie down lines that can be anchored to the ground using stakes or tied to heavy objects. It has a 9′- plus center height for extra clearance and plenty of room for a large folding table and chairs. 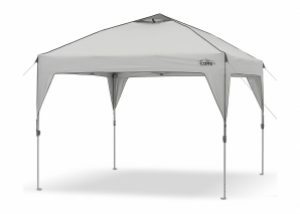 The Expedition EX64 from Quick Shade would be a best choice for anyone looking for a new canopy for their upcoming outdoor event. It can easily be transported back and forth inside the easy to carry polyester bag. The Pop-up Instant Canopy features several exclusive features that help to set it apart from some of the other canopies on our list. It is constructed of only the finest materials and has a built in height adjustability that depending on your needs. The large size provides up to 100 sq ft of shade and a maximum height of 12 feet. It all folds down and fits neatly into an easy to carry bag with rollers that make it easy to transport. 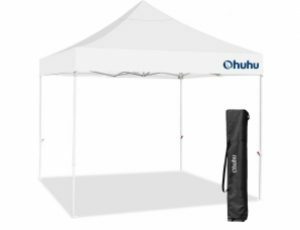 The Ohuhu best Pop-up Instant Canopy features a sturdy all steel foldable frame that makes pitching it extremely easy. 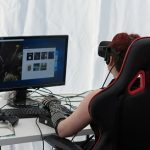 The frame also has an exclusive feature that allows the height to be adjusted to three different heights (59″, 86.6″, 94.5″) with a release button on each of the poles. The canopy is constructed of a heavy gauge 420D Oxford polyester fabric and is coated with an exclusive silver substance that provides a high level of UV protection against the sun’s rays. The quick setup design means that it can be pitched in just a matter of a couple minutes. Using the included guidelines and stakes you can be sure that it is anchored securely to the ground during a wind or rain storm. The Ohuhu is one of the highest rated by consumers on our list and it would make a great choice for anyone looking for great little shelter. The 10′ x 15″ Pop up Canopy is the commercial grade portable enclosure. It is constructed of all heavy duty materials in order for it to hold up the extraordinary amount of uses that a commercial company requires. It features four sidewalls that can be rolled up when not needed and it features an amazing 150 sq ft of covered space. The foldable frame makes it quick and easy to setup and it can be pitched in just a few minutes. The Pop-up Canopy can be configured into a wide range of different setups. The canopy of the 10′ x 15′ Pop up enclosure is made from a heavy duty 300D Oxford Fabric that is protected by an exclusively patented coating that prevents fade, water seepage and damage by the sun’s UV rays. The foldable all-steel frame has an anti corrosion powder coating to help extend the life of the frame. The extra long length makes it possible for it to hold two 6′ folding tables and chairs end to end. It also includes two zippered entrances to allow for privacy. The 10′ x 15′ Pop up Canopy Enclosure is perfect for most any occasion, it is sturdy enough to handle commercial uses, but it can also be used for tailgating and backyard get together. It would make the perfect choice for anyone. The high quality, commercial grade instant canopy from Snail is made using only the highest quality materials in order to deliver such a durable product. The large 10×10′ canopy creates an amazing 100 sq ft of the shaded area that is perfect for a number of uses such as tailgating, special events, and other commercial uses. The height is adjustable to three different levels and has a maximum height of 11′. The all steel folding frame is powder coated for long lasting durability and corrosion resistance. The frame was designed to make it easier to put it up and take it back down when you are done and it can be accomplished in a matter of minutes. 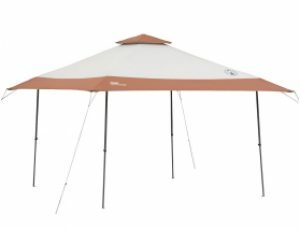 The canopy is made from heavy duty 420D Oxford Fabric that is protected by an exclusive coating that is waterproof and blocks the UV-rays from the sun. The canopy folds neatly back down and it can be placed in the included carrying bag to keep it safe and make it easy to carry. The Snail 10×10′ Commercial Pop up Canopy is a heavy duty portable shelter that fits neatly into a carrying bag and can be used for both commercial and residential type events. 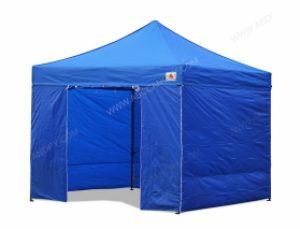 The Blue 8×8′ Pop up Instant Canopy is a compact convertible enclosure that can be switched between an open air gazebo style canopy to a fully enclosed tent. It is constructed of only highest quality materials for long lasting use. The 64 sq ft capacity is large enough for a small group of friends and family. The whole unit folds down into a neat little package that can easily be put inside the carrying bag and it also has wheels to make it easier to transport it from one location to another. The canopy is made from a rugged and durable 500 Denier Polyester fabric with heavy duty welded seams and has a protective coating against rain and UV-rays of the sun. The removable sidewalls are made from a heavy duty Denier 210 Polyester fabric and are secured to the poles using Velcro straps. The folding, all steel frame is powder coated to ensure that it does corrode or get damaged in any other way. It comes with a set of four weighted bags that can easily be secured to the four poles and help to keep the canopy secured in place. For additional security, it comes with four guidelines and stakes to anchor it into the ground. The Blue 8×8′ EZ Pop up Canopy is great looking compact enclosure that can be used for a number of different uses. It is really easy to set up and take back down after your event is over and then it slips neatly back into the carry bag. The Coleman Instant 10×10′ slanted poles with an 8×8′ upper canopy create a decent size 64 sq ft of shade and it features a 9′ high center height for better clearance. The poles feature extra wide welded on feet to them better stability when placed on a solid surface. The poles are attached to the upper frame in a slanted configuration for additional stability. Like all Coleman products, the Instant Canopy is made from the finest materials and workmanship which ensures that you always get your money’s worth. The frame of the instant canopy features an all steel folding design that is powder coated for durability and anti corrosion so that it lasts for many years to come. 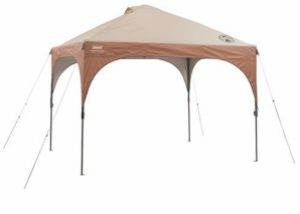 The canopy is made from an ultra durable, heavy duty polyester fabric with an exclusive UVGuard™ coating to prevent damage from the sun and rain. The poles are telescoping and can be adjusted to a number of different heights by pushing a single button on each pole. It also features an extra high center point for extra clearance inside. 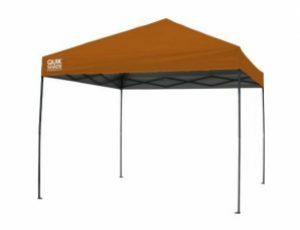 The Coleman Instant Canopy with extra wide base is best for a number of different special outdoor occasions like tailgating, picnic, and other family outings.